Durban – Success, failure or . . . . . ? After two busy weeks, the Durban COP was extended by a full day and then went well into a second, with long nights of negotiation along the way. Eventually a deal emerged which has polarized both the media and blogsphere between being the salvation of mankind or the quick route to runaway warming. In reality it is neither, but if that is the case then where are we? First the good news. After years of discussion, stalling and negotiation the Clean Development Mechanism (CDM) is now able to accept Carbon Capture and Storage (CCS) projects. This important technology now has the opportunity for global use under a clear set of rules that all countries have sanctioned. Of course there remains the ongoing issue of the low price of CERs, largely driven by the weakness of the EU-ETS, but at least the CDM will continue to exist thanks to a Durban agreement on the continuation of the Kyoto Protocol, albeit with a limited set of players. If nothing else, the “CCS in CDM” agreement puts CCS properly on the radar and hopefully paves the way for implementation through other means, such as via the Green Climate Fund. In addition to the move on CCS, the Green Climate Fund and Technology Mechanism both made useful progress. In comparison to expectations going into Durban, the COP could be regarded as something of a success. But these are small steps to take for a two week conference which attracts some 10,000 people (including observers). Of course the real objective is to make a major step forward and agree a way for all parties to begin rapidly reducing emissions. What then of the agreement in Durban to negotiate a new protocol (or another legal instrument or a legal outcome) by 2015 at the latest, for implementation by 2020? 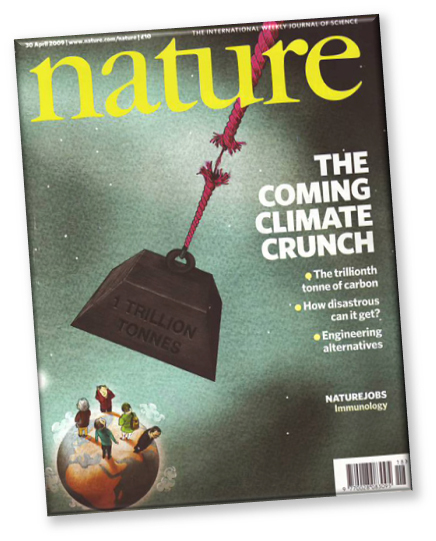 From the perspective of large scale mitigation action involving all the major emitters, this is good news, but given the reality of the rate of increase in the level of CO2 in the atmosphere, the story is really very different. The “do nothing” base case which sees emissions continue to rise at the rate of 2% per annum (global emissions increased by 2.5% p.a. over the period 2000 to 2009 – IEA) and accumulate in the atmosphere. This sees the trillionth tonne emitted in 2044 with continued rapid accumulation in the decades following. A dramatic (but of course hypothetical) deal in Durban which sees global emissions peak immediately and begin to fall at 1.7% p.a., the same rate of decline as currently built into the EU ETS. In this case the trillionth tonne is emitted just after 2100, but emissions are very low by this time and still falling, so the 2°C limit is effectively met. Business as usual continues until 2020, but the “Durban Platform” acts aggressively on global emissions post-2020, with emissions peaking in that year and then falling. To achieve the same outcome as Case 2 the annual rate of decline must now be 3% p.a. 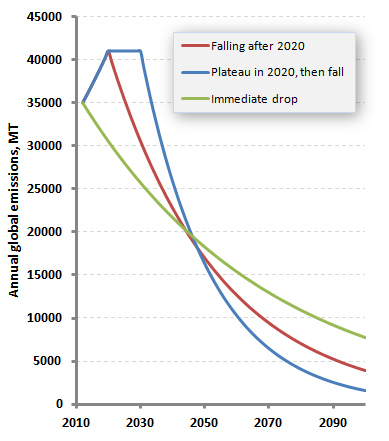 Business as usual continues until 2020, with the “Durban Platform” resulting in a global plateau in emissions from 2020 to 2030, then falling after that. Now the rate of decline must be over 4.5% p.a. to achieve the same outcome as Case 2. While the agreement to start negotiating again with a view towards implementation of a global plan from 2015/2020 must be seen as a positive development, the time lag now built into the process must equally be a cause for concern. There is nothing easy about emissions and the future, but starting the job today is an essential requirement for meeting the 2°C goal – this was also the clear message from the IEA (International Energy Agency) going into COP 17. A theoretical global decline of 1.7% p.a. is at least still within the bounds of technical (but clearly not political)plausibility, although only just, but arguably a reduction rate of 3% or 4.5% is beyond an achievable outcome. Even the financial crisis only managed to deliver a 1.4% reduction from 2008 to 2009 before emissions bounced back in 2010. A 3% p.a. decline from 2020 requires more than a billion tonnes per annum of reduction – or the startup of at least 130 very large CCS facilities that year and then each year after that. A 4.5% p.a. decline is considerably more difficult to achieve. The above cases 3 and 4 which both represent a robust deal coming from the “Durban Platform” are also very optimistic given the track record of the UNFCCC negotiations and perhaps of greater concern, the track record of national implementation of agreements made. Nevertheless, Durban may well be seen as a landmark COP and it may just mark the point at which attitudes change, but the shape of the outcome also makes the challenge ahead that much greater. A “Catch 22” to be delivered from Durban? What is the cost of doing nothing? The global temperature might have increased about 1C from the little ice age in 16th century while no negative effects of global warming have been observed so far. Quite opposite – there are great benefits of such warming. I’m sure CO2 price is beneficial for engineering companies and therefore I fully understand why Shell is lobying to increase CO2 and energy price. The only unknow for me is whether Shell scientific advisor understand basis of climate science. I acknowledge that response is pointless as Shell scientific advisor on global warming can give only one answer.